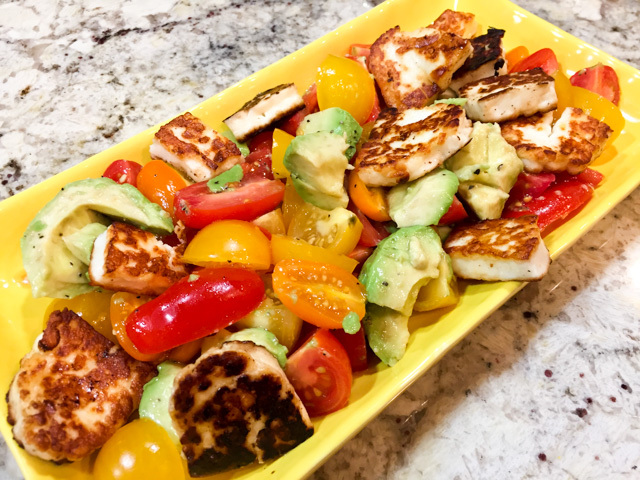 TWO SALADS AND A BLOG AWARD! Three reasons to smile today, how about that? Two very colorful salads to counteract the somber days of winter and the even more somber political scenario. Plus, the joy of receiving a blog award. Not bad to close the first month of 2017! The first salad was inspired by a very nice food blog, Hanady Kitchen. She is a veteran food blogger, but only recently I got to know her site. Better late than never. Love her cooking style. 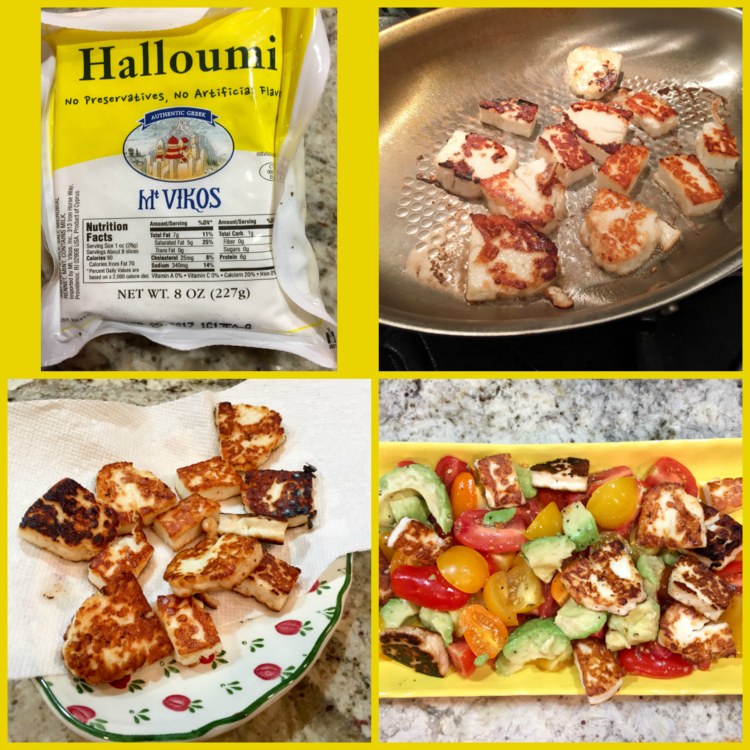 The star ingredient is Halloumi cheese, very unique ingredient that is worth trying to find in your grocery store. Depending on where you live it could be tricky. It is a grilling cheese originated in Cyprus, made of goat and sheep’s milk. Instead of melting away as a regular cheese would, it stands up to the heat and develops a crust that will leave a lasting impression in your gustative memory. Instead of the grill, I used my All Clad fish pan, and it worked like a charm. Heat the tablespoon of olive oil on a non-stick skillet. Add the squares of Halloumi and fry until golden brown, flip to fry the other side. Remove slices to drain on a paper towel, squeeze a little lemon juice over them. Reserve. Add the tomatoes and avocado chunks to a medium size bowl. Make a dressing with the grape seed oil, Verjus (or lemon juice), whisking well to combine. Add sumac, salt, and pepper, whisk again. Add the dressing to the veggies, then the pieces of Halloumi. Mix gently, adjust seasoning. Serve right away. Comments: Halloumi will definitely become a constant guest in our kitchen. Nothing quite like it. That crust is perfect, the texture inside still firm with that delicate sharpness of the cheese. Perfect to nibble all by itself, or added to salads such as this one. 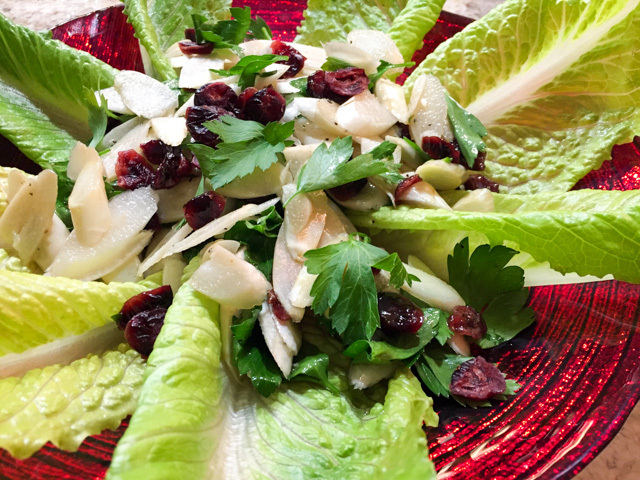 In a medium bowl, toss the asparagus with the parsley leaves and cranberries. Lightly season with salt and pepper. Whisk together the oil, vinegar, honey, and 1/4 tsp. each salt and pepper until emulsified. Toss the salad with enough dressing to lightly coat, and serve over lettuce leaves. Comments: The only “problem” with this salad is that one bunch of asparagus will make enough for two, three people tops. Making this for a crowd could be tricky, unless you don’t mind spending considerable amount of time slicing asparagus. Nothing wrong with that if it suits your mood… Be Zen, though. I was not sure Phil would like the salad, but he absolutely loved it, thought it was different from anything he’d ever had before. I tell you, the combination of raw white asparagus with cranberries is perfect. Plus they look nice together too. And now for the Blog Award! 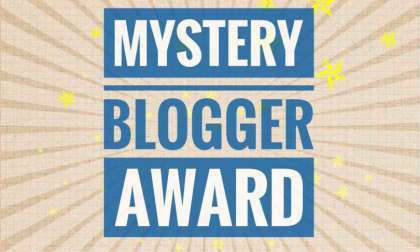 I was surprised with a comment from Bernadine (Bern Bakes) telling me that she awarded me the Mystery Blogger Award. Stop by here to read more about it. There are some rules, and of course I will break some of them, because as I mentioned before, I do not forward awards, so I hope I don’t offend anyone by it. Display award on blog DONE. Mention creator of the award & provide link DONE. Thank the blogger who nominated you and provide a link DONE. I guess these will do. I think I’ll add I am very good at multi-tasking, but maybe that comes with organization? And obviously it all melts away when faced with cake baking. Whats your current favorite T.V. show? Do you have a bad habit? Do you have a good habit? If you could meet one celebrity or person you admire who would it be? Why? President Obama. I don’t think explanations are needed. After almost 8 years of blogging, it’s very hard to choose my favorite. Instead, I will share the most popular on the blog, which happens to be one of my favorite cakes, I’ve made it plenty of times. THANK YOU SO MUCH, BERNADINE! TWO YEARS AGO: Somebody Stop Me!